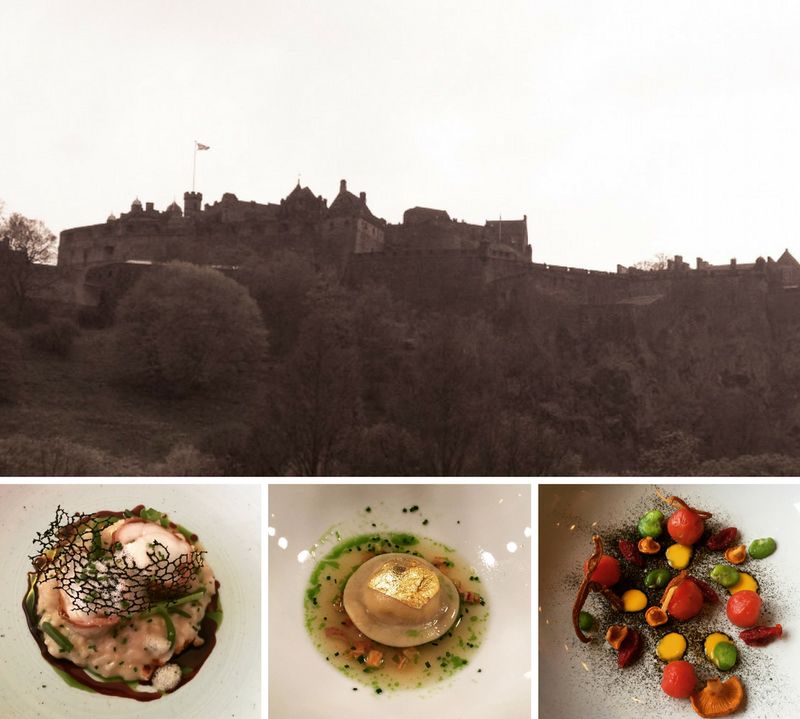 The Table is a very recent addition to the Edinburgh food scene. Only opened a few months ago by a pair of brothers, The Table offers a unique experience. There is only one table, seating ten, and only one sitting at that table per evening. This table is bar-like which wraps around the kitchen, so you can watch the two of them at work and chat with them as they go. Sean is the chef patron and has a passion for local produce cooked well. He cooks what he loves and it shows. The restaurant itself if small but perfectly formed, with muted green tones. The bar stools we were sat on were much more like chairs and surprisingly comfy throughout the meal. Once everyone had arrived, we were talked through how the evening would work. We were invited to chat and ask questions as we went, which I didn’t do too much as somehow I get a bit nervous when talking to chefs. It’s also BYOB which keeps your costs down (not that it matters for me as I cannot have wine, as regular readers will know) but I imagine the only down side would be finding matches for the food as it is a set menu, so perhaps bring a selection with you! First up were some canapes. The set of three had distinctly different flavours but matched well, with an Italian theme. First up was a small roll of pasta, filled with a bacon and tomato sauce with sprinkles This was crunchy and smooth all in one go. It was a delicious bite and the parmesan gave it great punch. Next up was a small madeleine with chorizo, wild honey and blue cheese. I normally avoid blue cheese but this was amazing. I think the honey balanced it out and the chorizo provided a good smokiness. My friend found it a little too sweet but that’s because she’s not overly keen on honey. Finally, was a liver parfait in the form of a grape. At first glance, you really would believe it to be a grape, even with an added real stalk to maximise the effect. This was smooth and flavourful. A great start to the meal. The next course was called A Bitter Sweet Munchkin Pumpkin. The pumpkins are really called munchkin pumpkins! The pumpkin was hollowed out. That in turn became a puree. The base of the pumpkin shell had a layer of scallop tartare mixed in with chestnuts and Douglas fir. The warm puree was placed on top and then a drizzle of coffee placed on top of that with some pumpkin seeds. Sean uses a forager to get some ingredients but only ones that will work well with dishes. The Douglas fir was a nice undertone but not intrusive. The cold tartare against the warm puree was a pleasant surprise. I had to eat the coffee bit first as I find coffee too bitter for my palate but that is very much a personal preference. Sean also mentioned that he likes his food to be edible straight away, so his food will often be served warm rather than hot. A man after my own heart! Following on was Golden Wonder Cheese and Onion, which was a cheese ravioli with edible gold leaf on top. This was placed in an onion broth which included dehydrated onion and chives. On the side was some sourdough bread, provided by Archipelago bakery, which had a slather of whey butter on top, which Sean is trying to get produced in Scotland rather than having to bring it up from England. This course was phenomenal. The cheese oozed out of the ravioli and mingled with the delightful onion broth. Each mouthful made me want more and more. The bread and butter were excellent, with the whey butter leaving a pleasant tang in the mouth. I could easily have scoffed more of this and was by far the best course, up to this point. Up next was The Beet Goes On. This was an amazing mix of black pudding, beetroot and cheese. The black pudding was a combination of both the dried ingredient version from Stornoway and a fresh ingredient local butchers black pudding. This was crumbled across the plate, interspersed with small cubes of candied beetroot, pistachios and Bella Dee cheese. This on its own was delicious. However, to add to the wonders of this dish, a pureed beetroot ball was placed on top. This brought everything together in a perfect way, oozing upon cutting over all the black pudding. All of this sat atop a bitter orange sauce, which on its own may have been too much but added an interesting note to the plate when combined with the rest of the food. The fish dish came next, humorously named A Dish Called Wanda. This was skate wing. The skate had been taken on the bone and cooked as a little parcel. It was incredibly moist and had a buttery, creamy depth to it. This was accompanied by a parsnip, which had a delicately soft core, parsnip puree, hazelnuts, seaweed and a beurre blac sauce. The whole dish was in harmony and nothing seemed surplus to requirements. I think this is a dish that would please all fish lovers. Onto the meat course, this time called Date ‘n’ Game. This was pheasant (although for some bizarre reason I haplessly told the chef it was the best partridge I’d ever eat – I told you I get flustered!). The pheasant had been cooked sous vide and was very succulent. It had been sat in a spiced brine before cooking which subtly permeated the meat. We were warned about shot, although the chef had tried to get it all out. I didn’t find any, which my teeth were thankful for. On top of the meat was a beautiful leek puree, which in turn was topped with charred leeks. The leek puree also adorned the plate, alongside a cider gel, toasted bread puree and small pieces of date and wild apples. This whole concoction can only be described as perfection. I could have licked the place twice over. The zing of the cider gel brought a freshness through the purees and the date and apple gave some contrasting textures which made my taste buds sing. Seriously stunning. At this point I really thought nothing could top that. Then up came a pre-dessert called Werther’s Not-So Original. This was a powdered caramel with Hebridean salt. It was presented as a crumb on a spoon and was recommended to be eaten in one mouthful. The ensuing experience initially sucked the moisture from your mouth and then turned the powder into a wonderful caramel chew, with a beautiful undercurrent of salt. This was a clever piece of work and a fun experience. I did wonder if they could make bags of this as a side business. I’d be a repeat customer. Then came the dessert aptly named The Land of Milk and Honey. Sean became very animated about sustainable honey at this point and explained just how important this is, whilst scraping the honey from a honeycomb frame for our dessert. This honey had wonderful flavour and worked so well with the accompanying elements of milk sorbet, milk foam biscuit and a crispy milk skin shard. A very understated yet elegant way to end the meal. We did have some petit fours to finish, alongside tea and coffee for those who chose. These came as a set of three. Firstly a juicy pear coated in white and dark chocolate and then rolled in toasted hazelnuts. This was fun and the pear was runny with juice which made it a nice surprise. Secondly there was a pumpkin jelly. This was of the sweet-type jelly variety and had a dusting of sugar. This was delicate and exceptionally good. Finally was a banana and chocolate doughnut. This was balanced well as the banana was strong without being too overpowering and the gooey chocolate felt quite luxurious. We left with a goodie bag with a chocolate covered honeycomb piece, their own hot chocolate and a copy of the menu in a branded bag. This place certainly knows how to look after their customers. The only downside is that being one table, it is difficult to chat if you come in a large group and if there are several groups, the table can be dominated by a particularly loud group. That being said, I would recommend this place in a heartbeat. You’ll need to get booking early as they are already fully booked for weekends for several months ahead and also for many days during the week. Get searching your diary for a date!